Hampton Rovers showed no mercy for bottom-placed Ivanhoe, running out 145-point winners at Ivanhoe Park on Saturday. From the get-go, it was all one-way traffic, with Hampton kicking eight goals to none in the first to lead by 52 points at quarter time. Another eight goals in the second term to the home side’s one had the Rovers up by 98 points at the main break. We saw the return of Daniel Corp to the seniors after a run in the reserves last week and he kicked the opening goal of the game although his radar was off with several misses. Great to see him back out there though and he’ll only improve with game time following a year off. To Ivanhoe’s credit, they stepped up after the half time break and slowed the scoring with just the three goals added to the Rovers score line all relatively late in the term, while kicking two goals of their own. Hampton kicked another eight in the final stanza to take the tally to 27 for the game with the home side slotting two majors. 12 players shared the goal kicking spoils for the Rovers, with Josh McPherson bagging five – four of those in the final term – and taking his season tally to 13. Josh Pavlou was one of 10 to miss out on a goal but his performance earnt him best on ground honours alongside a standout display from Adam Schaeche. It was another solid display by the Rovers backs. In successive weeks, they have held the opposition to a nominal score – in fact the Rovers have averaged 30 points against in the opening three rounds. In the middle of it is Luke Deville and Josh Pavlou who are in great form. 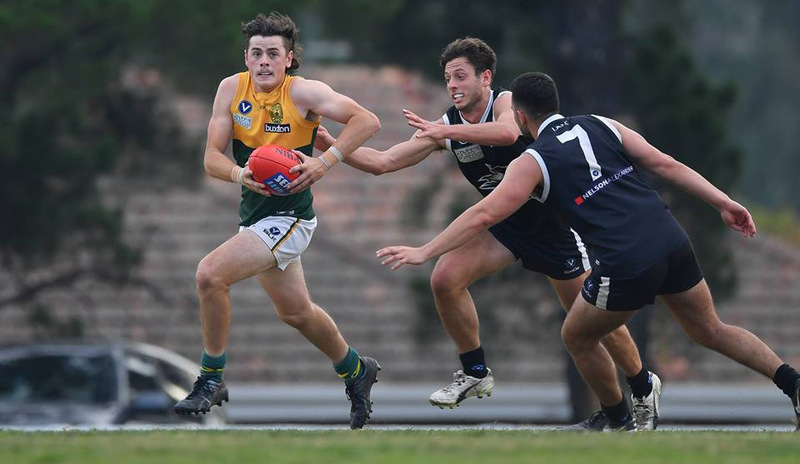 James Prosser is playing his best footy at the moment and Richard Atkins, whether playing down back or up forward (he kicked 3.3), is playing the type of football that earnt him senior appearances for the Sandringham Zebras last year. Harry Crisp continues to grow in confidence while Ben Traeger-Haig, returning from injury, also played a key role. Both captains are unstoppable at the moment. Adam McNeil is playing all over the ground and getting countless possessions while Christian Carnovale, with his strength and power, crashes through tackles and is also racking up the touches. He finished with two goals and had a number of assists. Josh Broadley’s confidence continues to grow in the ruck and his agility around the ground is a great plus. He’s combining well with the midfield and Ryan Fogarty and Finn McMaster are taking advantage of his tap work. Cam Hetherington continues to improve and stamp his authority, imposing himself on the packs and pulling down some big marks at times under great pressure and kicking goals – he finished with four for the day. Also great to see big Sammy Clements providing a target up front and kicking three goals himself. The only sour note was when the game was stopped for around 15 minutes late in the third term after Nick Murnane landed flat on his back with some help from his opponent after taking a strong mark. With an ambulance called, he was eventually carried from the ground and the club is pleased to report Nick has recovered well, all things considered, and there appears to be no major injury. The Rovers now sit at the top of the division one ladder with a percentage of 324.07% with Ormond the only other undefeated team. A special thanks to the helpers this week: Trent Kneebush who goal umpired, Kam Atkins for timekeeping, Lachie Wheeler and Zac Donald for water and Daniel Andersen for running. It was a similar result in the early game, with the Reserves running out 157-point victors against Ivanhoe. Nick Jackson kicked 10 goals as the Rovers put on 28 majors to Ivanhoe’s three. In fact, the total winning margin across the two games was 302 points! View the full match report. The Thirds also recorded a victory, against UHSVU at Boss James Reserve (report) while the Under 19’s and Senior Women were defeated (report). This Saturday, the Seniors return home to host Brunswick NOBS in the annual ANZAC Day match at Boss James Reserve. Bookings are now being taken for the big home game luncheon.